This is Pam from The BugBytes and Papillon Digital Designs today with you on Shes a SassyLady. Thanks Sheila for having me as a Sassy designer. School year is coming to and end and holidays are here. It's a busy time isn't it? Today I have a card to show you. Recently I got an brother embroidery/sewing machine and decided to try it out. 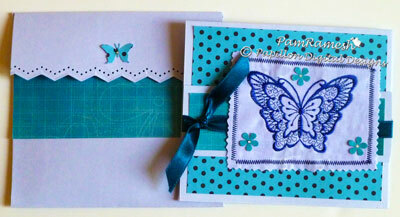 It was a bit intimidating so I chose a one color simple project to start with - a butterfly. I embroidered this with a stabiliser on a cloth but soon I am going to try it on paper too. The base of the card is light bluish violet and not white. I used that to make a simple envelope from scratch too. 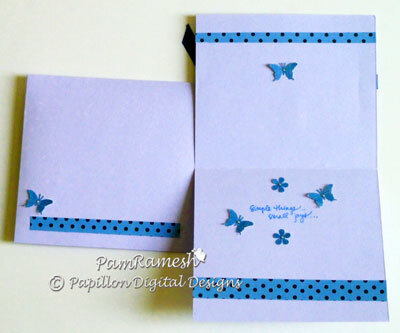 The paper flower , paper butterflies and envelope edge punching are from Ek success punch and Martha Stewart punches. The sentiment on the inside of the card is from paper trey ink. Thanks for reading and thanks Sheila for having me here on your blog. Beautiful card. I just discovered your blog and I love it. Thank you for sharing your talents.